We can thank Debs for this month's Sparkles Christmas Challenge. Your card must have a Festive Sentiment. For mine I am using one of my older dies. It's from Stamp Oasis and it's from 1992. Yikes that's 25 years old! I guess I've been playing with paper for quite awhile! Because Debs asked for a festive sentiment...I wanted mine to be the focal point. I love monochromatic cards. 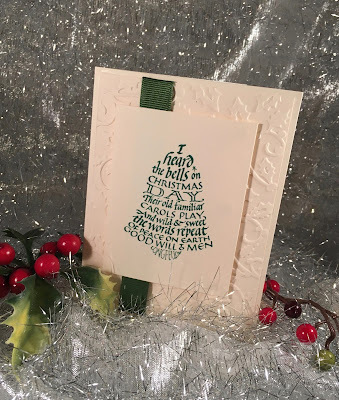 I am using a buff colored base that was dry embossed using a Sizzix embossing folder. I stamped the sentiment, added a bit of ribbon, popped the sentiment and the front of my card is finished. My inside is a Quietfire Design stamp. This stamp made the inside of this card easy. I must say this card came together quickly and it's one of those cards that would be easy to create assembly line method. Ok, it's your turn....get out a favorite sentiment or two and share your creation with all of us. Hop on over to see what the other Design Team members created and link your card to this site. It's fun, it's easy and you'll be one card closer to finishing your Christmas Cards! Link your card HERE. I'm sending wishes for a Super Creative Month. Yikes, I must have been asleep when I wrote this blog. I said my image was a die.... well, I know you already figured out it was a stamp. Goodness! I hope you enjoy the card, even though the creator is a bit fuzzy brained. Mary, LOL about your comment, but loving your card. That stamp is fabulous! Thank you! It's nice that this stamp fit the challenge perfectly. I'll be using it more often. Have a crafty week. Thanks Sandra. I love it when a card comes together quickly. Have a wonderfully crafty week. Thank you. I love the inside sentiment. I often use it on the outside of the card. I'm doing well. I'm on my last day in Chicago with family. Then I'm on my way back to California and the heat. Have a craft filled week. Stunning card Mary! so long since we spoke, hope you are doing well. Love the elegant card, think I might try and find this Quitefire sentiment, mind bet it`s long gone..
Pam, that stamp is still being sold. 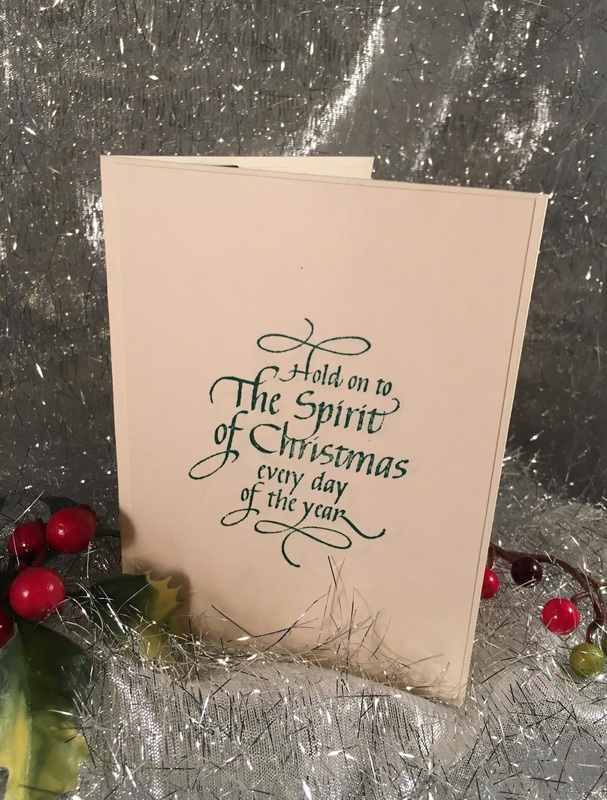 http://www.quietfiredesign.ca/Hold-on-to-the-Spirit-of-Christmas-Mounted.html Along with other beautiful sentiments. Oh lovely! Great stamp and nice CAS card.